Providing employees with a comprehensive employee handbook, rich with information on policies and procedures, is vital for any company. Writing out the policies is a major challenge to tackle in itself. But what if you need to create manuals for different offices? Or update critical information, such as a company name or contact information, across all your handbooks? With this in mind, we’ve created a new pre-written Employee Handbook Manual template, now available as a free download for all MadCap Flare users. This new project includes a wealth of information on employee policy and procedures, and can be edited and tailored to meet your needs. And since the template is available in Flare, content can be easily single-sourced, allowing the user to create different versions for departments, offices, divisions, and more. Want to preview the employee handbook manual? To view a web output of the Employee Handbook project, click here. To view a PDF output of the project, click here. Flare will open and prompt you to unpack the ZIP file. This will create a project. Variables are brief, non-formatted pieces of content (such as the name of your company’s product or phone number) that can be edited in one place but used in many places throughout your project. They’re especially good for text that might change frequently, such as a company name, phone number, or a contact name. The Employee Handbook Manual template includes Variable Sets to define the name of the company, company contact details, and more. For example, there is a variable to define the company name throughout the entire Manual. It is currently defined as “FictionSoft”, but you can redefine the variable to your company name, and that text will update across the entire manual. To change the definitions for the variables used in this template, edit any of the Variable Set files. You can also create and insert new variables for other purposes. There are two placeholder logo images in this project—one using the PNG (raster) format for online output and the other using the EPS (vector) format for PDF output. Vector images work well in print-based output for logos, because they do not lose clarity when resized. Before selecting a new logo in the topic, you should save your image(s) at the desired size. The size of the PNG placeholder logo is 229 x 55 pixels. The size of the EPS placeholder logo is 244 x 58 pixels. You do not need to match either of these sizes exactly, but your logo image(s) should be sized to look good both in the online and PDF output. This project is configured with two target output types – PDF and Responsive HTML5. This means you can produce a PDF version of the manual, and a searchable, navigable, HTML5 site, perfect for your intranet. If you want to produce more outputs from your source, you can create new target files and configure them as necessary. More information on creating and editing target outputs can be found here. 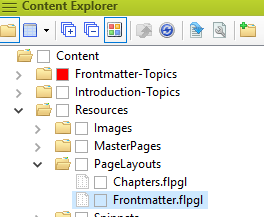 Want to modify the cover page for your PDF outputs? 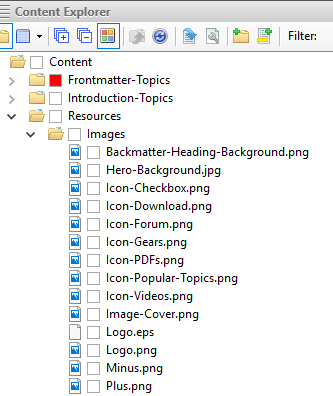 There are two page layouts in this template – one for the title page and TOC, the other for the rest of the pages in the PDF output, including the chapters and back matter (e.g., glossary,index). You can make adjustments to the page layouts to alter elements such as the page size, margins, body frames, or footers. In Flare, a skin is a file that contains information about the appearance of an online output window, including navigation elements. In this project, the HTML5 target uses a Responsive Side Navigation skin. You may want to customize the look and feel of the skin, so that elements such as logo images and colors align with your corporate branding requirements. More information on editing the Side Navigation skin can be found here. We hope you enjoy this new resource. If you are brand new to MadCap Flare and want to learn more about its capabilities, our Introductory Training course is available as pre-recorded modules, and included with all free trials. Feel free to leave comments below or reach out to me at jmorse@madcapsoftware.com for any questions!